CONCEPT: Southwest Charters is willing to provide their usual and new clients a new way to enjoy the Algarve's sea in style. 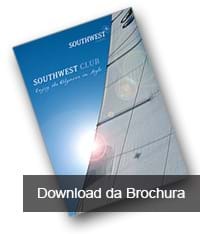 Either you are a skilled sailor who is just fed up with the responsibility that comes with owning a boat or a complete beginner who just wants to visit and see the Algarve coastline in fast and fun boats, Southwest Club will provide the solution and necessary training to accommodate all levels and members. No experience is not a problem! Within two days we provide the necessary training through the RYA to make you able to skipper these amazing powerboats safely and skilfully. If you want to learn how to handle a sailing yacht it may take a bit longer, but it’s possible to do it in two weeks. SWClub enables everyone to step into the world of boating through an annual subscription. Members receive an allocation of points, which they exchange for days in one of our luxurious sailing yachts or powerboats, and enjoy more days and more time in the water. The annual subscription is paid up front, so over and beyond the subscription fee you pay absolutely nothing. The boats are maintained by SWC professional staff, which ensures that your boat is going to be ready and in pristine conditions when you come down to sail away. SWClub primer objective is to provide the members more time in the water enjoying the sea, leaving out all the hassles of boating like mooring fees, maintenance, insurance, tax, and repairs. Sound impossible… well it’s not!!! Leave the hard work to us! Most boats are used only for a few weeks per year, sitting in the marina for the rest of the year, costing both time and money to the owner. This represents a huge amount of money and diverts people from owning a boat and going out to sea. By joining SWClub, the members have the opportunity to use our boats for the period of time they choose (and need) without the time and money consuming activities that come with boat ownership. In sum, the costs are fixed and much more reduced and the time spent on the water is maximized. From as little as €2,700, each member is allocated points. 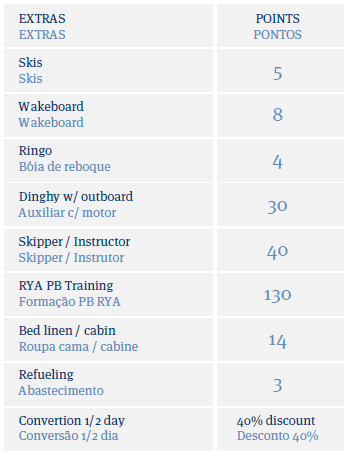 These points are then exchanged for days in one of our Power Boats RIBs (Rigid Inflatable Boats) or Sailing Yachts﻿. 02What are my options when joining SWClub? There is a simple booking procedure and most importantly, due to a strict limitation of members per boat, they very rarely are all reserved even in the peak season, so decisions can be made the day before﻿. High Season - July & August; Low Season - Any other month. You never lose out if you don’t use all your points during your membership as they will still be available on the following year. 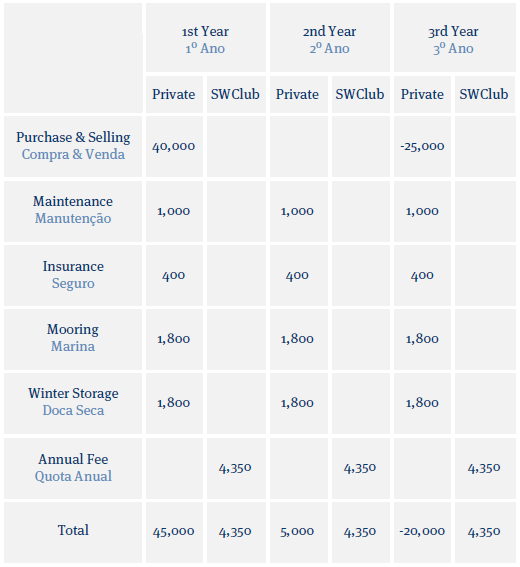 Below is a table showing calculating in joining SWClub for three years and buying exactly the same boat (Capelli Tempest 626) and selling it after three years. Total cost over 3 years in buying the boat, paying fees for 3 years and then selling it for 62.5% of the original purchase price = €30,000 Euros. Total cost of being a member of SWClub for 3 years including VAT, is €13,050* which is a 65,25% saving. 05Are there any other costs to be considered? Over the low cost for the annual membership, there is a security deposit of 1.500€, which will be returned at the end of the contract. This is the maximum amount charged to a member in case of accident. The fuel costs are in charge of the member. 06Can I split the membership costs with a friend/familiar? 07Can I pass the rights of usage to another person? If you want to give days from your package to a friend, the member must be always aboard. The person in charge of the boat must comply with all the current legislation for operating pleasure craft. 08When can I use the boat? You must reserve the days you plan to use the boat by contacting SW Charters (email or phone) with a minimum of 2 days in advance. You will be given access to an online calendar where you can confirm the available days of the boat.